30 x 25 inches, 76.3 x 63.5 cm. Miss Auras, The Red Book represents the summation of Lavery’s talents as a portrait painter. By the early 1900s Lavery had assimilated those influences which contribute to his mature style. Deft and accomplished, Miss Auras is defined by the confidence of its execution and the palpable delight Lavery took in delineating his sitter. Lavery met the sixteen-year-old Mary at Unter der Linden in 1901 and immediately embarked on a series of full length portraits including Mary with Roses (1902; Johannesburg Art Gallery). The series culminated in Printemps (1904; Musee de Orsay) which shows Mary wreathed in filmy white and armed with an abundance of apple blossom. Lavery’s exploration of those themes traditionally associated with female beauty – fulsomeness and plentitude - place these images within an artistic trajectory which stretches back through the centuries. This continuum inspired a sequence of consecutive exhibitions, entitled Fair Women, which Lavery staged at the International Society of Arts during the early 1900s. He had contributed to a Glasgow-based show of the same name in 1892, but the dawn of the new century must have seemed an appropriate time to reexamine beauty’s changing face. Under his own auspices, Lavery was able to display his contemporary pieces alongside paintings by 19th Century masters such as Millais and Watts – advocates of the romantic ideal. Next to these narrative evocations, Lavery’s work appeared modern and fresh; possessed of a dynamism which was in part due to the bold manipulation of paint. Mary Auras featured frequently and The Red Book was exhibited in 1908. Critical reaction was unanimously positive, but of intriguingly differing bent: The Studio saw Mary as epitomizing innocence; a reading which aligned itself to the Parisian interpretation of Printemps, which was deemed the perfect representation of Anglo-Saxon beauty. The irony of such commentary delighted Arnold Bennett, who reported that Mary was as popular in her native country: ‘the rage of Berlin’, and ‘had received 5 proposals in three months’. (Norman Flower, ed., The Journals of Arnold Bennett, Cassell and Co, 1932, pp. 17, 170). Lavery was himself aware of the potentially incendiary nature of Mary’s presence, and enlisted the company of his studio assistant or daughter when travelling with her in order to uphold propriety. 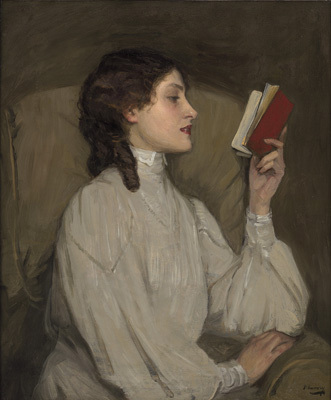 Miss Auras, The Red Book is considered to be the most important of those half-length portraits Lavery executed of Mary. It is unusual in its representation of a full, and pleasingly chiseled, profile. Her gesture as she angles the slim volume is full of alacrity – there is none of the languor which so often characterizes images of women in repose. The book’s scarlet cover is in piquant contrast to Mary’s white dress, itself an evocation of Whistler’s Symphony in White series (1862-4). Whistler had befriended Lavery in 1887, three years after the younger artist first admired his work at the major Dublin exhibition in 1884. Miss Auras, The Red Book is particularly comparable to Whistler’s Symphony in White, no 2 (Tate Britain), which shows the model in profile, leaning against a mantelpiece and holding a Japanese fan. The edited elegance of this image is echoed in Miss Auras, however its ethereal melancholy is displaced by Mary’s vitality and poise. Lavery’s other inspirations included Velasquez, whose bravado style he had admired on a trip to Spain in 1891-2, and Reynolds, whose work provided a template for his reconfiguration of grand manner portraiture. Two related oil studies of Mary’s profile are known (Private Collections). Lavery continued to experiment with the reader theme, painting his wife Hazel in a subsequent half-length composition (The Red Book – Lady Lavery, 1925, unlocated).